More than 1 in 10 young Marylanders are both out-of-school and out-of-work. These youth, between the ages of 16 and 24, are considered “disconnected”—lacking the social, academic, and employment connections that lay the foundation for a successful future. Some are high school dropouts. Others may be unsuccessful in making workforce connections due to family obligations, lack of marketable employment skills, substance abuse, homelessness, incarceration, disability, or difficulty aging out of the foster care system. 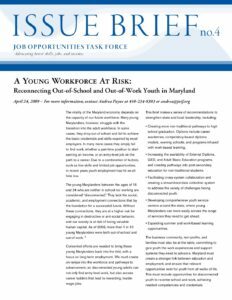 A new Issue Brief from the Job Opportunities Task Force explores the extent of youth disengagement in the state, and provides recommendations for re-connecting young Marylanders to school and work. State and local leaders must act now to expand programs that help youth find their talents, build skills, and enter the stable career paths. This includes second-chance on ramps for youth who have dropped out of high school, pathways into post-secondary education, and programs that emphasize the link between education and employment. JOTF has also created a series of local youth workforce profiles to accompany the new Issue Brief. The profiles, available for Baltimore City and Anne Arundel, Baltimore, Montgomery and Prince George’s Counties, provide details on local youth employment, educational enrollment and attainment, and other selected indicators.